Sometimes, Big Companies have Big Hearts. Posted November 4th, 2011 by Karl & filed under Technology. Even though most may already know about this story as it’s been released on TheNextWeb and on Destructoid, I wanted to re-iterate it here again as I think it really is a heart-warming gesture to counter some of the more cynical of those out there. Destructoid fan Carlo’s friend Michael John Mamaril, an avid Borderlands fan, recently passed away due to cancer at the young age of 22. 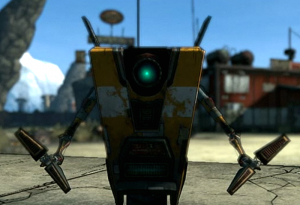 As a token of his friendship to Michael, Carlo sent a request to Gearbox asking for a short eulogy to be read by the games mascot robot Claptrap. Not only did Gearbox uphold this request, they also plan to introduce his character as an NPC in their new game Borderlands 2. It will quite interesting to see just how they represent him in the game when it comes out. The move took me quite by surprise. I imagine when Carlo sent the request in, he was probably not even expecting a response, yet alone what Gearbox have actually decided to do. I suppose however, looking at it with my cynics cap on, it’s not like such a move won’t have favourable consequences for them. No doubt (as it already has), this will spring forth very good PR for the team. With their new game Borderlands 2 looming around corner, any additional PR they can produce in the wake of it will be more than welcome by the team. Supposedly, this isn’t the first time Gearbox have done something for their fans. A previous fan asked them to help him propose to his girlfriend, to which they also said yes. You can listen to Claptrap’s eulogy and the Gearbox teams response by going to Destructoid’s original post on the subject, found here. Picture courtesy of Borderlands Wikia.